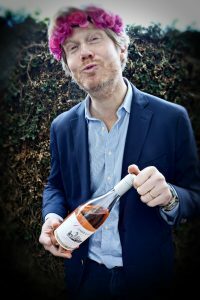 Winemaker Franck-Lin Dalle talks to WW about the incredible man behind Campuget Estate’s post-WWII resurrection, the importance of doing what you like in life, and why so many young people are drinking rosé today. Dalle went on to tell a story about how when he picks up his two daughters from middle school, their friends sometimes crowd the playground, chant- ing, “Ed Sheeran is here!” Indeed, Dalle could be mistaken for a four-time grammy award-winning doppelganger, but we’d venture to argue that the winemaker and face of Campuget is a rockstar in his own right: the rockstar of rosé. Between riding down warehouse forklifts and doing the duck face at WW photoshoots, there was abundant and lively conversation. As rockstars do, Dalle charmed us with stories and tales of his family’s château, a magnificent stone property that dates back to 1640. 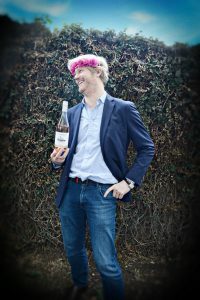 His sister operates a bed and breakfast there, and he serves as the chief owner, managing the vines and the team and making sure everything is up to par. 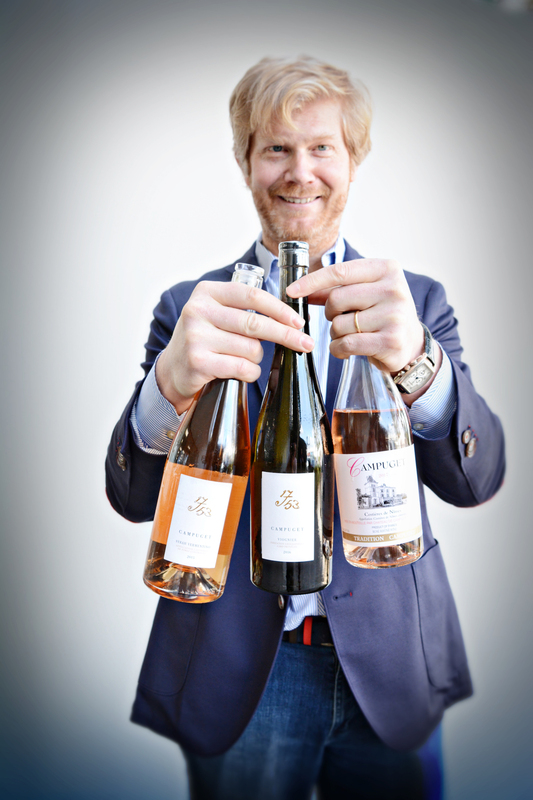 His efforts have been overwhelmingly successful in California – last year, WW sold 3,289 cases of rosé alone. Read on to get to know the rockstar behind the Campuget bottle. What’s a fond memory you have growing up on the estate? To pick one of the memories on the estate is difficult because I was born there, I grew up there and I have plenty of memories. One which is important to me is when I was working with my grandfather on the estate. I was working every day. This is the first one that is coming up from my mind right now. We [would have] a chat for an hour, just working. They were fantastic moments and I’m sure they have structured my brain a lot. Can you tell us about your grandfather and how he began Campuget? What is his story? The story of Campuget started one day after the Second World War. My grandfather was from the northern part of France. He was injured during the war as a soldier, and he had to leave the north. The doctor told him, your injury is so bad, you have to go to the south to find the dry weather. He was making beer in the north of France [with his family], so he went to the south, and he ended up in Campuget. He heard about this estate. This estate was totally bankrupt. He took it over with his brother-in-law first. They managed the company together. During the 80’s his brother-in-law decided to retire, and so one of his brothers joined him. Since then, we have been working with all the family together on this property. What was your grandfather’s wartime injury? He was very lucky. He received a bullet in one eye. Two millimeters deeper, and he would have been killed. Even though he lost one eye, he always had a very good view on the future. What was one of the most important things you learned from him? My grandfather taught us that we are European people. He lost an eye from a German bullet. And I never heard a bad word about German people from my grandfather. That was fantastic, honestly. From this, I learned a lot. Two things – Europe is important for us, and is our future of course. The second thing is that we have to respect everybody on earth. Even if we don’t agree, we have to respect everybody. We read that you started working on the estate full-time after practicing law in Paris. What was that change like? How did you switch from working in law back to the family estate and working with your hands? It was a choice I made when I was three or four years old, I knew one day I would live on Campuget Estate because I love it, I have it on my blood. Working in the law business in Paris has been a way for me to be aware of Campuget and to realize that I needed Campuget. It hasn’t truly changed my life. Working on thick carpets in Paris is different from working at Dalle on the tables or in the vineyard. But on both sides I was working hard, because I like working hard, I like to learn, I like to discover. This what I did when I was working as a lawyer, this is what I do today as a winemaker. It’s different countryside, it’s a different daily organization, but both are just about working. I think it is important to do what you like in your life, and this is what I like today: to make wine. My small part of [life] working as a lawyer has been an opening in my brain to this reality – what I like is making wine. What is daily life like in the countryside, in Costières de Nimes? There are always beautiful days. We have a lot of sun in the south, 325 days of sun. Day to day life: I will wake up at 5:30 or 6:00 in the morning, go to the cellar, prepare with the team on working in the vineyard or the bottling program. We’ll discuss with customers, and we’ll discuss with administration. We have a lot of administration in France, so it takes a lot of my day. It’s a little bit of everything, and this is actually what I like. Winemaking, managing a vineyard is a job that gives you a lot of freedom. I like it very much. I am free to do what I want to do, when I want to do it. This is a very unique job. You can do it, and you can do exactly what you want, when you want. This is another interesting thing, my days represent a little bit of this freedom. I select the field where we are going to plant, we have to select the clone, the vine we are going to plant, we have to select the bottle, we have to select the label, the restaurant, the distribution, you have to do a little bit of everything. That’s the beauty of this job, you are not focused on one thing. I am not able – psychologically ready – to focus on one thing. I need to touch a little bit of everything. Speaking of distribution, what is your relationship with Dreyfus-Ashby and Wine Warehouse like? There is a slogan at Dreyfus. Its “Dreyfus means family.” This is truly the feeling that I have today, with Dreyfus and with Wine Warehouse. This is something important. Campuget is a family estate. Working in a family business is very special. It gives you an identity. You need someone behind the bottle, and there is someone behind the bottle. Behind this glass of course you have the bottle, and behind the bottle, you have the Campuget family, and behind Campuget family, you have Dreyfus family, and behind Dreyfus family, you have Wine Warehouse family. It’s a chain. This chain must be strong to have great success, and we are very strong all together. You mentioned before how you tasted wine when you were three, four years old. Are you sharing that experience with your own daughters? Are they having their first sips? Of course. My daughters taste wine, not on a daily basis but very often they taste wine, and they ask for it. The funny thing is – when [we] started, in the beginning, I told them, “Taste it.” Now they ask, “Dad, can we taste it.” We build and we educate like this. Let’s talk about rosé. In America and California especially, rosé is everywhere. These slogans, rosé all day, you see them on social media all the time. People wear shirts that say this, and hats, and it’s on their phone covers. It seems like this big phenomenon that’s gotten so trendy. 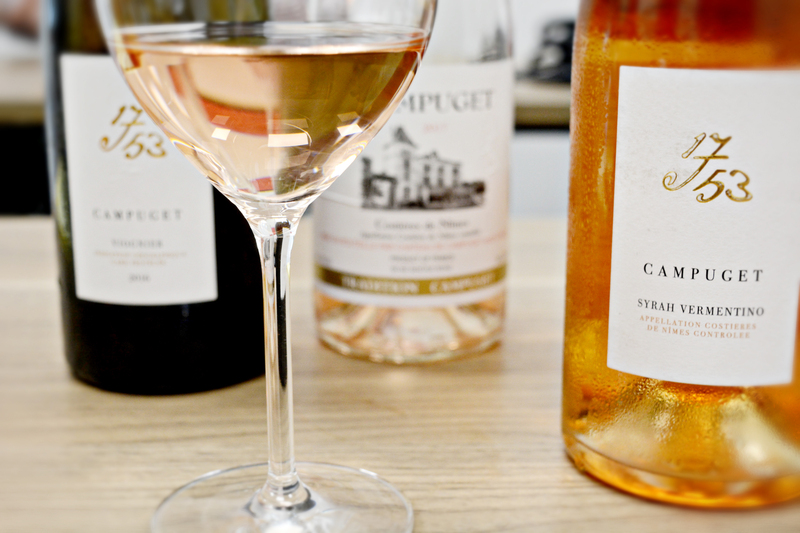 But in France, rosé has been around for a long time and it’s actually an old world wine. Can you talk about rosé’s history and why you think it’s so popular now? In the south part of France you know, the weather is very warm. From May to September, it’s crazy warm. 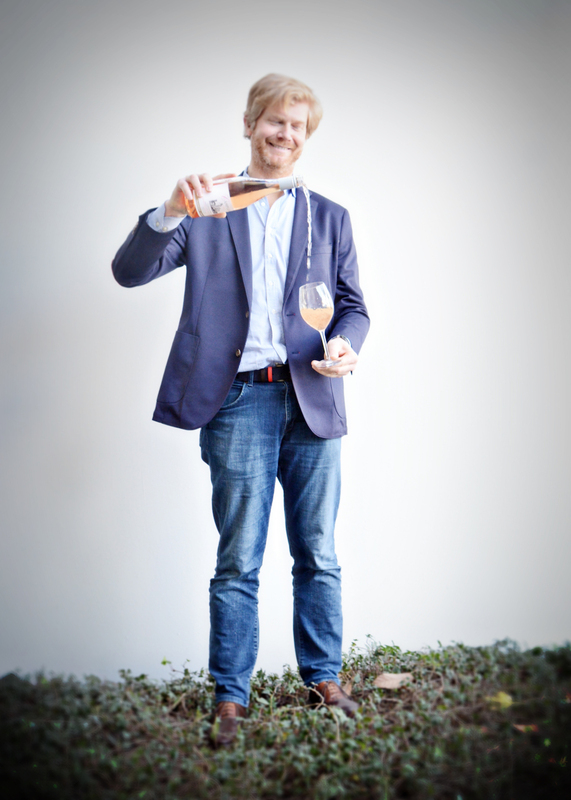 Rosé was a way to give a drink to people working in the field to decrease the painful job they had. They were drinking rosé. Less than 20 years ago, people were allowed to drink rosé during work in the field and the vineyards. It was truly a part of the daily life and the work. The reason why people were able to drink it easily is because of course [its cold], but you have freshness, you have a little bit of fruit. It’s easy to drink. It slowly but surely became a drink coming out of a simple drink. 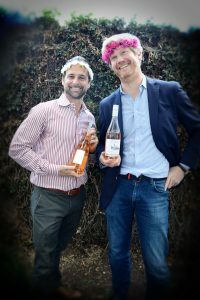 When you see young people drinking rosé, they realize rosé is the right entrance to the wine world. Tannins are very soft, you have a little bit of fruitiness, a nice acidity. For me it’s a perfect entrance to the wine world. Once you get in, you realize you can have plenty of different rosés to enjoy every day. That’s why you have some rosé all day. What’s something about winemaking that you’ve learned that you wish other winemakers learned too? For me, the wine is a drink. This is something we should never forget. Sometimes [when] I drink wine, I can put a spoon in it, and it’s thick, rich, jammy. I will have an experience with one glass and it will be an experience. When I said wine is a drink, it’s because after one glass, if I want a second one, if I want a third one, if I want a bottle of it, this is fantastic. I think all winemakers should be reminded of this. We are making wine, as a drink, but as a noble drink, and it should always be [easily] drinkable. This is very important. What makes Campuget a noble drink? There is truly a link between the soil, the vine, and the drink. We try to respect our soil, we try to respect our vines, to let them produce the best fruit possible, and we try to take care during the winemaking. This is fully a wine process production where we respect everything. That’s why it’s noble. We respect the environment, we respect the people working on the property, and we are working with great people who are representing our wines everywhere. Saying that, we try to make a process with respect to the fruit. 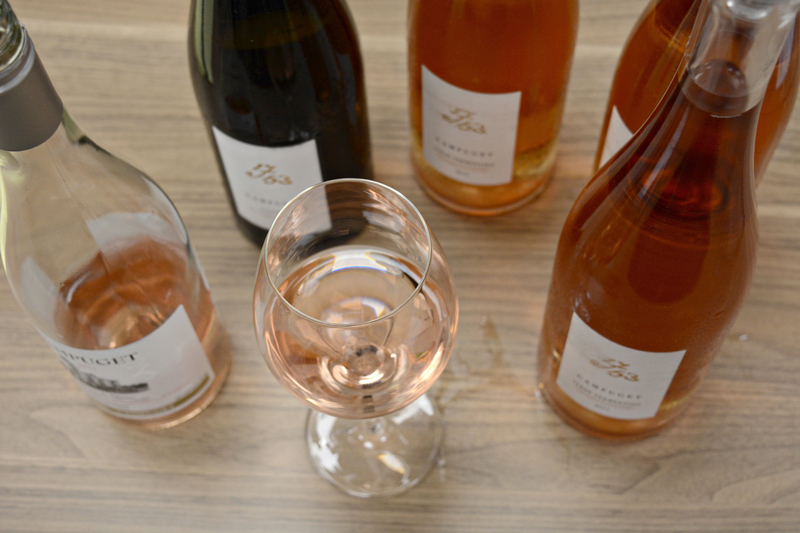 We try to make an elegant rosé, fresh, dry, that you can enjoy easily. Altogether, it makes it a noble rosé and a noble wine.